For years, there has been a demand for large fume hoods and other containment devices to handle bulky process equipment. Many types of experiments are placed in these hoods: syntheses involving distillation columns, reflux reactor flasks, and racks of analytical vessels like Kjeldahl digestion flasks. 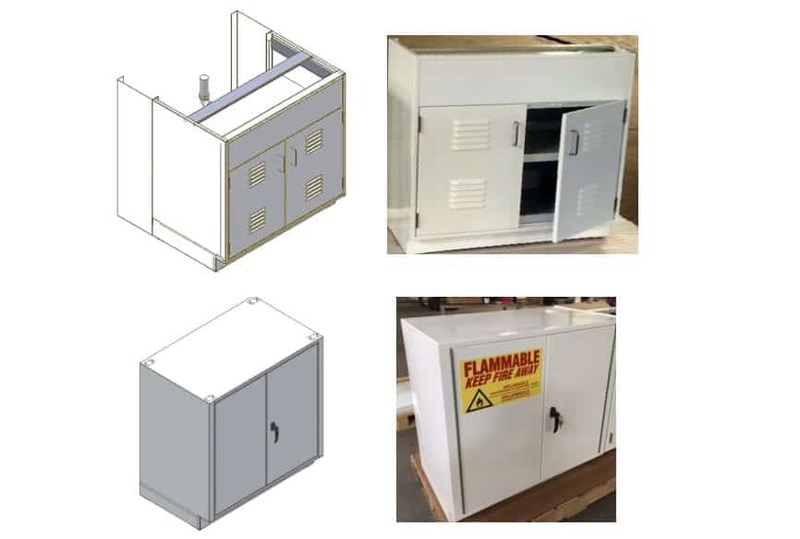 This paper reviews the types of large fume hoods now available, typically desired units, applications such fume hoods are used for, and the changes and improvements made in these units in the past three decades. Years ago, standard floor-mount fume hoods were called walk-in hoods. Nobody should walk into/work inside these units, but equipment on carts would frequently be pushed into these units for manipulation. One major difference between bench hoods and floor-mount hoods is sash and exhaust requirements. Floor mount hoods are sized at 50% open. This means the desired face velocity (80 FPM, for example) is calculated with the bottom vertical sash closed.The primary reason for this restricted opening is to avoid the extraordinary amount of air that would be required to have a floor-to-roof opening running at an acceptable face velocity. Since exhaust air HVAC expenses can be higher than $10/CFM-year, most users are averse to running these hoods with the sash fully open. Frequently, a fume hood “halfway” between a bench hood and a floor-mount is the best choice. This fume hood may be used with tall distillation or chromatography columns, or with bulky equipment which never needs to be wheeled anywhere. This hood is frequently called a distillation fume hood orhigh-boy. Obviously, floor mount hoods are far less frequent in modern labs than bench hoods. When one is purchased, there is a high likelihood there is a specific purposefor the device. In other words, such a hood needs to be closely evaluated before it is sized and constructed. As stated in a recent published paper *3*, applications should always help define the containment device. Large floor-mount fume hoods have a long history in laboratories. They are built larger to accommodate large lab equipment or processes and come in a variety of sizes and accessories. Unlike more conventional bench fume hoods, these hoods will normally be customized to accommodate specialized experiments or procedures. It is highly recommended that such fume containment devices be customized to fit the intended application. Be containment-tested, preferably while performing its intended function. Be sold with a manual that focuses on its specific purpose, use, assembly, and maintenance specifications.